Diabetes mellitus is a metabolic disease in which the body is unable to produce insulin or respond to insulin production, consequently leading to abnormal metabolism of carbohydrates, lipids and proteins causing elevation of glucose in the blood. Oxidative stress, an imbalance between the production of free radicals and body antioxidant system has been implicated in the pathogenesis of diabetes. Free radicals attack important macromolecules leading to cell damage. Antioxidants are intimately involved in the prevention of damage caused by free radicals. 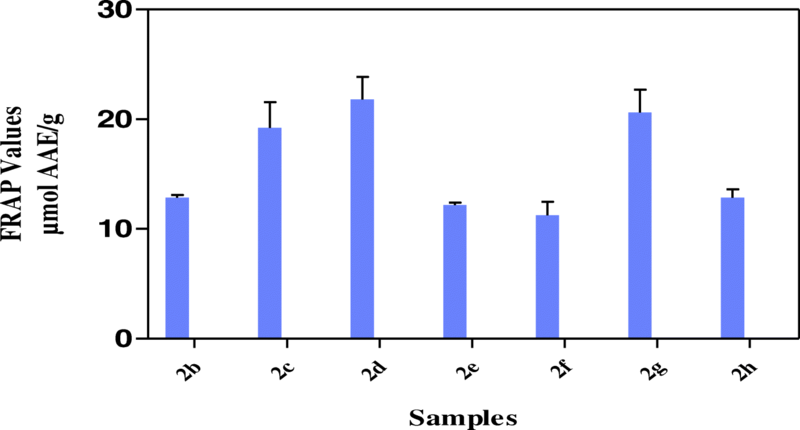 The anti-diabetic effects of hybrid compounds (2a-h) of thiosemicarbazone and triazole containing methoxy groups at C (4) positions were tested against genes involved in glucose metabolism (Glut-4, Mef2a and Nrf-1) using quantitative real time PCR (qPCR). Free radical scavenging capacity (FRAP, TEAC, DPPH and ORAC) of the hybrids was also carried out by using established antioxidant capacity assays. From the results, hybrid compounds 2b and 2h showed more pronounced effects in up-regulating diabetes associated genes which are important in the up-regulation of glucose uptake. All the hybrid compounds also showed free radical scavenging abilities. In conclusion, hybrid compounds (2b and 2h) can be useful as potential drugs for the management of diabetes mellitus. Thiosemicarbazones are biologically active compounds which are obtained by the condensation of thiosemicarbazide or a substituted thiosemicarbazide with a suitable aldehyde or ketone. Thiosemicarbazones derivatives have been reported to have antidiabetic, antiviral, anticancer, antibacterial, antifungal, and antimalarial effects [1–8]. 1,2,3-Triazole is a heterocyclic compound which belong to a class of azole. A triazole is a five-membered aromatic ring which contains at least one nitrogen atom and another heteroatom such as nitrogen, oxygen, or sulphur in the ring. Triazole derivatives are known to have antifungal, antibacterial, anticancer, antimalaria, anti-inflammatory activities [9–14]. Derivatives of triazole have also been reported to protect pancreatic β cells against endoplasmmic reticulum stress-mediated dysfunction and death . 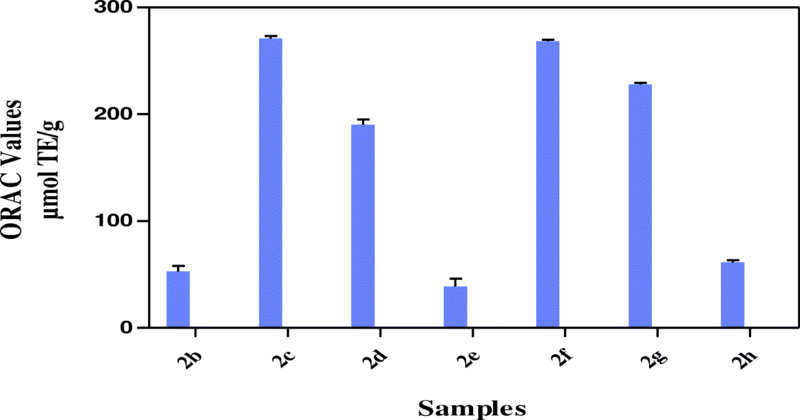 Hybrid compounds of thiosemicarbozone and triazole have been evaluated for their biological activities against malaria, obesity and diabetes [16–18]. A free radical is any molecular species that is capable of independent existence, possessing an unpaired electron in an atomic orbital . Examples of free radicals include superoxide (O2•−), hydroxyl (OH•), peroxyl (RO2•), hydroperoxyl (HO2•), alkoxyl (RO•), peroxyl (ROO•), nitric oxide (NO•), nitrogen dioxide (NO2•) and lipid peroxyl (LOO•) . Antioxidants are molecules which can safely interact with free radicals and terminate the chain reaction before vital molecules are damaged, inhibiting the oxidation of susceptible biomolecules such as proteins, lipids and DNA  thus, playing a role in the prevention of oxidative damage to the body. Antioxidants are known to exhibit antioxidant activity by donation of hydrogen atoms or single-electron transfer to a radical . Type 2 diabetes mellitus is a disease where the body either produces little insulin / ceases to produce insulin, or becomes progressively resistant to its action . Upon stimulation by insulin, GLUT4 is a glucose transporter that is responsible for the uptake of glucose molecules into muscle cells and adipose tissue and it is reported to be indirectly regulated by NRF-1 through transcription of the gene myocyte enhancer factor 2 (MEF2) [18, 24, 25]. MEF2 is a transcription factor that binds to the promoter of the GLUT4 gene which in turn, regulates its transcription and expression [25, 26]. Experimental analysis on the antidiabetic and antioxidant potentials had earlier been done on hybrids compounds from thiosemcarbazone and triazole . These compounds were further improved through the addition of a functional group (aromatic ring containing methoxy) at C (4) position (Fig. 1). The aim of this study was therefore to investigate antioxidant potentials i.e. free radical scavenging ability of the improved synthesized hybrid compounds of thiosemcarbazone and triazole as well as their influence on the expression of some genes associated with type 2 diabetes. 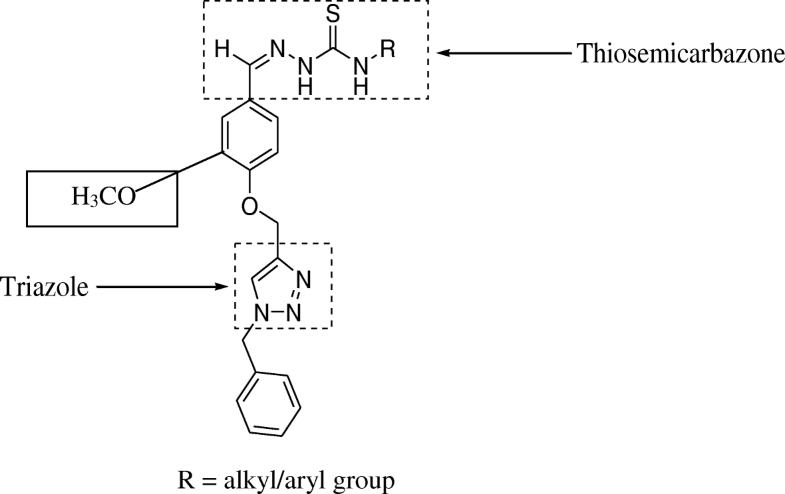 The synthesis of the hybrid compounds (2b-h) were synthesized in a similar fashion as published by [17, 18] except for the addition of an electron donating group (methoxy substituent to C(4) position of the aromatic ring joining thiosemicarbazone and triazole..
3T3-L1 adipocytes cell lines used in this study were collected from Prof E.O. Ojuka at the Department of Human Biology, University of Cape Town, South Africa. The cell lines were originally from American Type Culture Collection (ATCC) through Prof J.O. Holloszy at the Washington University School of Medicine, Missouri, USA. 3T3-L1 adipocytes cell lines were cultured using Dulbecco’s modified Eagles medium (DMEM) (GIBCO, USA) supplemented with 10% Foetal calf serum (BioWest, France) and 1% penicillin/streptomycin/fungizone (GIBCO, USA) at 37 °C with 5% CO2 and 95% humidity. The maintenance of the cells was done in continuous passage by trypsinization of subconfluent cultures with Trypsin/Versene (Highveld, RSA). Differentiation was induced by introduction of medium containing 2% Foetal calf serum and 2% penicillin/ streptomycin/fungizone when pre-adipocytes were 80% confluent. Cells were kept in this medium for 5 days until adipocytes were well formed. Differentiated 3T3-L1 pre-adipocytes were treated with 5 μL of compounds (10 mg/mL) 2b-h or 100 nM insulin or Metformin for 4 h.
Total RNA was isolated and purified from the treated cells using QIAzol lysis reagent (QIAGEN Sciences, USA) and RNA clean and Concentrator-25 (Inqaba Biotech, SA). Double stranded cDNA was synthesized from 3 μg of the total RNA using Superscript Reverse Transcriptase III (Invitrogen, USA). Real time quantitative PCR was done in triplicate using Rotor gene-3000 quantitative real-time PCR machine using Sensi Mix SYBR No-ROX One-Step Kit (Bioline, UK). The primers used were mouse Glut4 gene (Forward primer- 5’ GCA GCG AGT GAC TGG AAC A 3′; Reverse primer- 5’CCA GCC ACG TTG CAT TGT AG 3′), Nrf-1 gene (Forward primer- 5′ AAA CAC AAA CTC AGG CCA CC 3′; Reverse primer-5’ CCA TCA GCC ACA GCA GAG CA 3′) and Mef2a gene (Forward primer-5′ GTG TAC TCA GCA ATG CCG AC 3′; and Reverse primer-5’ AAC CCT GAG ATA ACT GCC CTC 3′). The amplification occurred in a 3-step cycle: denaturation at 95 °C for 5 s, annealing at 60 °C for 10 s, and extension at 72 °C for 15 s. Relative mRNA expression was normalised to mouse Actin reference gene (Forward primer- 5′ GAG ACC TTC AAC ACC CCA GCC 3′; Reverse primer- 5′ GGA GAG CAT AGC CCT CGT AG 3′) and calculated according to relative standard method. This assay was carried out using the principle of 2,2- azino-bis (3-ethylbenzothiazoline-6 sulphonic acid) (ABTS) radical scavenging activity according to . ABTS+ solution was prepared and left overnight before use by mixing ABTS salt (8 mM) with potassium persulfate (3 mM) and then storing the solution in the dark until the assay could be performed and ABTS+ solution was then diluted with distilled water. The sample (25 μl) was mixed with 1 ml ABTS+ solution (300 μl) and left for 30 min at room temperature. The sample was read at a wavelength of 734 nm. Trolox was used as the standard and results were expressed as μmol TE/g sample. All determinations were done in triplicates. The FRAP assay was done using the method described by . The sample (10 μl) was mixed with 300 μl FRAP reagent (a mixture of acetate buffer (pH 3.6), tripyridyl triazine (TPTZ) and FeCl3 ·6H2O). After incubation at room temperature for 30 min, the samples were read at a wavelength of 593 nm. 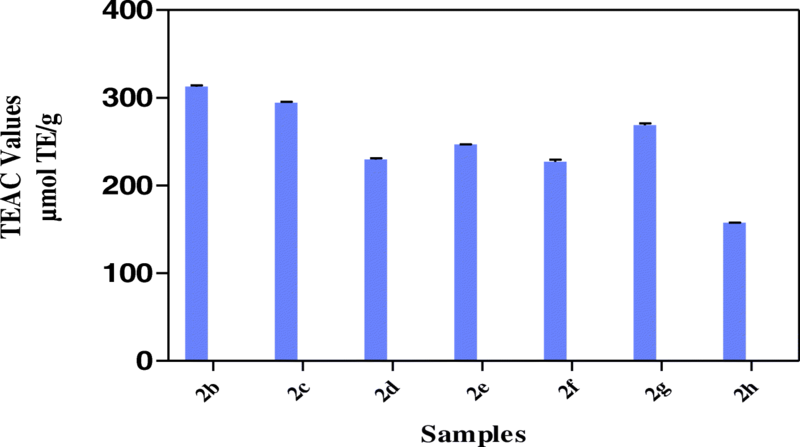 Ascorbic acid was used as the standard and the results were expressed as μmol AAE/g sample. All determinations were done in triplicates. Where A° is the absorbance of DPPH∙ in solution without an antioxidant and A is the absorbance of DPPH∙ in the presence of an antioxidant. The ORAC assay was carried out according to the method of  using a fluorescence plate reader (Thermo Fisher Scientific, Waltham, Mass., USA). The reaction consisted of 12 μl of diluted aqueous plant extracts and 138ul of fluorescein (14 μM), which was used as a target for free radical attack. The reaction was initiated by the addition of 50 μl AAPH (768 μM) and the fluorescence (emission 538 nm, excitation 485 nm) recorded every 1 min for 2 h in triplicates. Trolox was used as the standard and results expressed as μmol TE/g sample. Results are presented as means ± SD. Statistical analysis was performed by one-way ANOVA followed by the Tukey’s post hoc test. The level of significance was accepted at P < 0.05. All statistical analyses were performed using GraphPad InStat 3 software. The results in Fig. 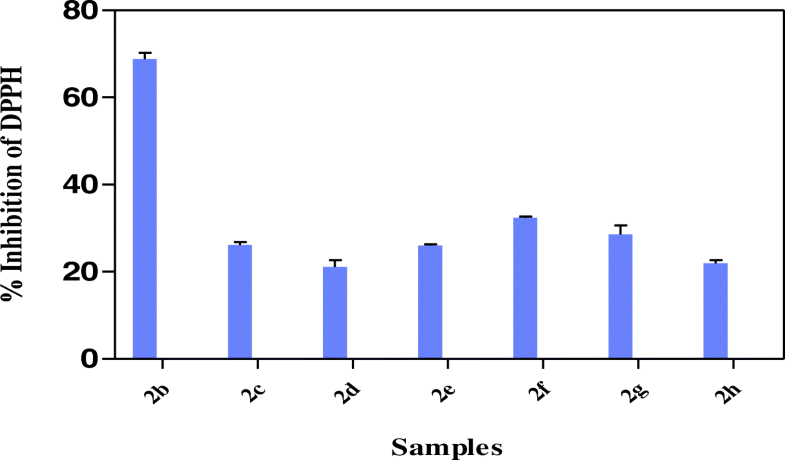 2 showed that all the hybrid compounds possess hydrogen or electron donating abilities through ABTS assay in relation trolox as standard with hybrid compound 2b showing the highest TEAC value of 312.9 ± 1.41 μmol TE/g. Other hybrid compounds had TEAC values of 294.6 ± 1.10 μmol TE/g (2c), 229.8 ± 1.21 μmol TE/g (2d), 246.7 ± 0.40 μmol TE/g (2e), 227.1 ± 2.55 μmol TE/g (2f), 268.9 ± 2.09 μmol TE/g (2f) and 157.4 ± 0.64 μmol TE/g (2h). The results in Fig. 3 showed the strength of the reducing power of the hybrid compounds with 2c, 2d and 2g having FRAP values of 19.2 ± 2.37 μmol AAE/g, 21.81 ± 2.06 μmol AAE/g, 20.62 2.09 μmol AAE/g respectively, followed by 2b, 2e, 2f and 2h with FRAP values of 12.9 ± 0.25 μmol AAE/g, 12.2 ± 0.21 μmol AAE/g, 11.25 ± 1.23 μmol AAE/g and 12.9 ± 0.76 μmol AAE/g respectively. Among the hybrid compounds, 2b had the most pronounced inhibition of DPPH (68.9% ± 1.40) while others have 26.1% ± 0.69 (2c), 21.1% ± 1.59 (2d), 26.0% ± 0.29 (2e), 32.4 ± 0.37 (2f), 28.5% ± 2.12 (2g), 22.0% ± 0.69 (2 h) inhibition of DPPH (Fig. 4). All the hybrid compounds showed inhibition of peroxyl radical with 2c, 2d, 2f and 2g having ORAC values of 270.9 ± 2.12 μmol TE/g., 190.2 ± 4.92 μmol TE/g., 268.3 ± 1.29 μmol TE/g and 227.9 ± 1.59 μmol TE/g respectively followed by 2b, 2e, and 2h with ORAC values of 53.0 ± 5.11 μmol TE/g, 38.84 ± 7.31 μmol TE/g and 61.4 ± 2.00 μmol TE/g respectively (Fig. 5). The results in Fig. 6 showed that all the hybrid compounds except 2f stimulated the expression of glut-4 better than control. Hybrid compounds 2b, 2d, 2e, 2g and 2h showed expression of glut-4 better than the standard drugs, insulin and metformin when compared with the control. Hybrid compound 2h showed a more pronounced increase (3.9 fold of the control) and was followed by hybrid compounds 2b, 2d and 2g with 3.3, 3.6 and 3.3 folds increase respectively when compared with the control. The results in Fig. 7 showed that the hybrid compounds 2b, 2c, 2d, 2f and 2h expressed Mef2a better than standard drugs, insulin and metformin relative to the control. The effect of 2b was almost 12 fold increase in the expression of Mef2a followed by hybrid compounds 2d and 2h which exhibited 6.3 and 7.4 folds increase, respectively relative to the control. The result in Fig. 8 showed that all the hybrid compounds except 2e and 2f stimulated the expression on Nrf-1 gene in relative to the control. Hybrid compounds 2b, 2c, 2 g and 2h expressed Nrf-1 better than standard drugs, insulin and metformin. Hybrid compound 2h showed a more pronounced increase in expression (4.8 fold of the control) while 2b, 2c and 2g showed 3.8, 3.4 and 3 folds increase in the expression of Nrf-1 gene relative to the control. Antioxidants prevent cell and tissue damage as they act as free radical scavengers, neutralizing the electrical charges on free radicals and thereby hinders them from accepting electrons from other molecules [31, 32]. Elevated levels of free radical molecules result in oxidative stress in cells, leading to the destruction of vital macromolecules including DNA, lipids, and proteins . Oxidative stress, an imbalance between the production of free radicals and the ability of the body antioxidant system to fight back, has been implicated in the pathogenesis of many chronic diseases including diabetes mellitus. Antioxidants alleviate oxidative stress, the adverse effects of free radical  and reportedly help in slowing down aging process and fight diseases such as diabetes mellitus, hypertension and cancer [32, 35]. Hybrid compounds, 2b, 2d and 2c are non-polar long alkyl chains of the amine moiety while non-polar short alkyl chains of the amine moiety are hybrids, 2a, 2e and 2f (Table 1). Hybrids compounds, 2g and 2h are aryl containing amine groups (Table 1). In this study, the biological activities of hybrids (2b-h), containing electron donating group (methoxy group) at the aromatic linker of both thiosemicarbazone and triazole at C4 position were investigated for their free radical scavenging abilities and expression of genes involved in glucose uptake. ABTS assay is an excellent means for determining the antioxidant activity of hydrogen-donating and chain-breaking antioxidants . It involves electron transfer process and is based on discolorations of ABTS by antioxidant compounds thus reflecting the amount of ABTS radicals that are scavenged within a fixed time period in relation to that of trolox . In this study, ABTS scavenging ability reported as trolox equivalence antioxidant capacity (TEAC) revealed that the hybrid compound 2b had the highest value which was followed by 2c while 2h had the lowest (Fig. 2). The FRAP assay is reproducible and linearly related to the molar concentration of the antioxidant  and the reducing capacity of a compound could be used as an important indicator of its possible antioxidant activity . In reducing power assay, antioxidants act as electron donor which reduces the Fe3+ complex to its Fe2+ and the reducing power is indicated by higher absorbance values . In this study, assay of reducing activity was based on the reduction of ferric to the ferrous form in the presence of reductants (antioxidants) in the tested hybrid compounds and measuring the greater absorbance of blue colour solution at 700 nm showed greater reducing power. The values for the reducing power (from Fe3+ to Fe2+) of the hybrid compounds was reported as ascorbic acid equivalents (Fig. 3) with 2d having highest FRAP value, followed by 2g while 2f was the lowest. The results indicated that all the hybrid compounds had reducing properties, thus revealed their antioxidative potentials. In this study, DPPH inhibition value shows the antioxidant ability of the hybrid compounds by accepting an electron or hydrogen radical to become a stable diamagnetic molecule. DPPH assay has been widely used as quick, reliable, and reproducible parameter for showing in vitro antioxidant activity reducing the violet colour to yellow coloured product in the presence of antioxidant . DPPH• is a stable radical showing a maximum absorbance at 515 nm and method is based on the reduction of DPPH• in alcoholic solution in the presence of a hydrogen-donating antioxidant due to the formation of the non-radical form DPPH-H in the reaction . The study showed that the highest DPPH inhibition value was 2c and followed by 2f while the 2d was the lowest (Fig. 4). The results confirmed that the hybrids were able to reduce the stable radical DPPH to the yellow-colored diphenylpicrylhydrazone suggesting their scavenging potentials by its proton donating ability. The ORAC assay uses 2,2-azobis(2-amidinopropane) dihydrochloride (AAPH) for free radical generation and measures the antioxidant inhibition of peroxyl-radical-induced oxidations which shows the radical chain breaking antioxidant activity by H atom transfer . 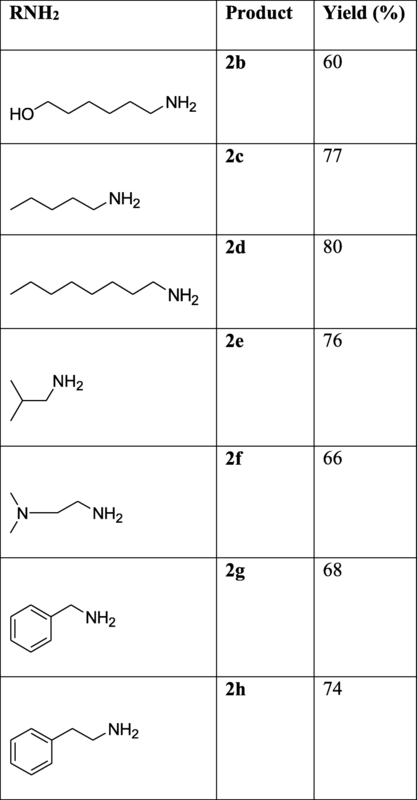 All the hybrid compounds showed ORAC values 2c having the highest with 2f as the next while the lowest value was 2e (Fig. 5). The results also confirm the antioxidant potency of the hybrid compounds. GLUT4 is a glucose transporter that is responsible for the uptake of glucose molecules into muscle cells and adipose tissue upon stimulation by insulin . 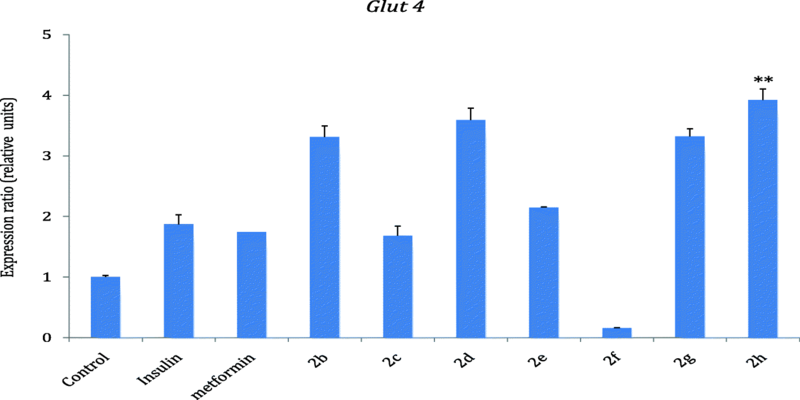 The expression of Glut4 in relation to the test compounds was compared with the control. As shown in Fig. 6, all the hybrid compounds except 2f showed more expression of Glut4 than the control with hybrid compounds 2b, 2d, 2e, 2g, and 2h stimulating Glut4 expression more than insulin and metformin. Furthermore, Mef2a gene expression was investigated on compound 2b-h. (Fig. 7). MEF2 is a transcription factor that binds to the promoter of the GLUT4 gene thereby regulating its transcription and expression. Ramachandran et al  has also shown that the transcription of the gene myocyte enhancer factor 2 (MEF2) is regulated by NRF-1. Mef2a was better expressed by 2b, 2c, 2d, 2f, 2h than the standard drugs, insulin and metformin relative to the control. In addition, Hybrids 2b-h were also tested for their effect on the expression of Nrf-1 gene (Fig. 8). The test results showed that all the hybrids except 2e and 2f stimulated the expression of Nrf-1 gene relative to the control (Fig. 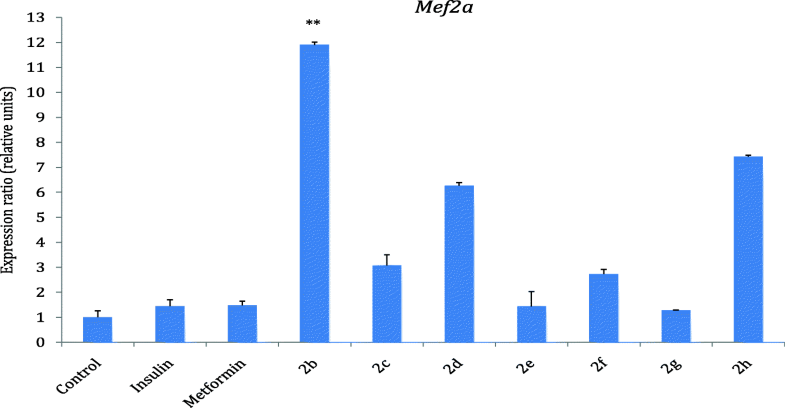 8), with hybrids 2b, 2c, 2g, and 2h expressing Nrf-1 better than insulin and metformin relative to the control. Overall, hybrid 2b with a non-polar short alkyl chain of the amine moiety and 2h, an aryl containing amine group were consistently up-regulating Glut-4, Mef2a and Nrf-1. The study showed the abilities of the hybrid compounds in trapping free radicals which are present in biological systems from a wide variety of sources. This study also revealed that hybrids 2b and 2h had consistent stimulatory effects on glucose uptake as shown on the expression of Glut-4, Mef2a and Nrf-1. These compounds might be important in the up- regulation of glucose uptake. It can be deduced from the results that the hybrids could help in the scavenging of free radicals and thus inhibit the oxidative mechanisms that could lead to diabetic complications. Hence, this study shows that these compounds can be useful as therapeutic agents in the treatment of diabetes mellitus. We thank the National Research Foundation of South Africa (NRF), North-West University, South Africa and Cape Peninsula University of Technology, South Africa and Adeleke University, Nigeria for support. We also thank the Department of Chemistry, University of Johannesburg, South Africa for the synthesis of the compounds. National Research Foundation of South Africa (NRF) provided funding for the study to Prof Emmanuel Mukwevho (Grant numbers: 76194, 88062 and 109326). Cape Peninsula University of Technology, South Africa also provided funding through Prof Oluwafemi Oguntibeju (reference no: CPUTRJ23). EM, OO, AOA and JSJ designed the experiments, AOA and JSJ carried out the experiments and analysed the results, AOA and JSJ wrote the manuscript, EM and OO supervised the experiments. All authors read and approved the final manuscript.